(Office of Her Majesty – Press Department – Davos) - Her Majesty Queen Rania Al Abdullah announced the launch of a new learning platform catering to school-aged children across the Arab World on Wednesday. The Queen made the announcement during an event hosted by Google on the sidelines of the World Economic Forum (WEF) in Davos, Switzerland, which was attended by His Majesty King Abdullah II. Google CEO, Sundar Pichai, was also present. Developed with the support of a USD 3 million grant from Google.org complemented with engagement from Googlers to provide product design expertise, the platform comes as an expansion of Edraak, the leading Arabic massive open online courses platform for adult learners. The new school-learners Edraak platform will offer free online open educational resources, generating much-needed Arabic digital educational content that meets the learning needs of Arab students from kindergarten to grade 12 (K-12) and their educators. The platform was created in answer to rampant unrest across the Middle East and North Africa (MENA), where according to UNICEF more than 15 million children are out of school as a result of armed conflicts and displacement. Regional turmoil has also compromised the quality of education offered in stable refugee-host nations like Jordan, whose education system has been strained under the weight of additional large numbers of students. 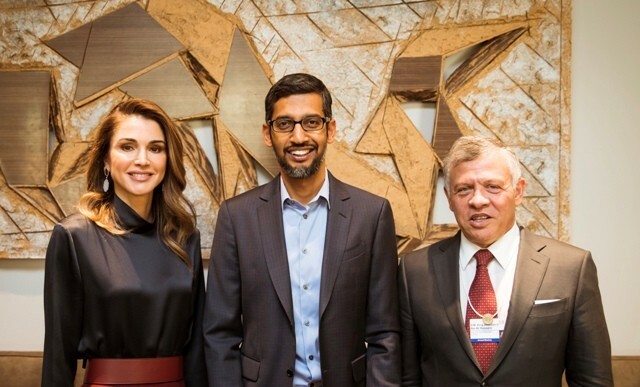 Speaking at the Google-hosted event, Queen Rania underlined education as a solution capable of bringing “hope, stability, and opportunity” to the Middle East. “We cannot wait for generations of children to grow up in darkness, vulnerable to extremism and hopelessness,” she explained. An initiative of the Queen Rania Foundation for Education and Development (QRF), the K-12 Edraak platform harnesses the power of technology to bring free quality learning opportunities to Arabic-speaking children across the region, whether in or out of school, including those in refugee camps and conflict zones. The platform, which will be accessible to more than 100 million children, will also offer tools and resources for parents and educators, empowering them to guide children’s learning journey. Currently in its pilot phase, mathematics materials for grades 7 and 9 are now available on the platform, offering children free access to more than 1,200 educational minutes of bite-sized video lectures, assessments, and interactive exercises. The full maths stream for all grades will be completed by year end. According to Queen Rania, Edraak aims to provide all Arab school-age children with free access to quality education by 2020. This includes e-curricula and learning resources in all major subjects, including mathematics, physics, chemistry, biology, English, Arabic, and computer programming. “Google.org is proud to support the Queen Rania Foundation’s efforts to bring quality education, in Arabic, to underserved learners in the Middle East and North Africa, which aligns to Google’s mission to leverage technology to close gaps in global education. This is an important milestone in the evolution of Edraak into a platform that unlocks new learning opportunities for K-12 students in the region,” said Jacquelline Fuller, President of Google.org. The new platform offers sequential learning material as well as student-centered inquiry-based learning, making it possible for students to search for specific concepts or skills without having to enroll in a predefined learning sequence. Given the growing need to support remedial education due to the conflict and unrest that have disrupted formal education in the region, the platform adopts a competency-based approach to learning, while also providing material that can be used in a blended learning setting. Designed to align with national curricula, the platform will provide key resources for use in the classroom, enabling teachers to create virtual classrooms and make data-driven teaching decisions. Meanwhile, parents can also play an active role in their children’s education through the creation of linked accounts, which allow them to monitor children’s performance and progress. The new platform builds on the success of Edraak’s existing platform for adult learners, which has reached over 1.5 million people across the MENA region since its launch in 2014. Leveraging its experience in developing educational content generated specifically for Arab learners, the launch of the school learners’ platform advances Edraak’s comprehensive goal of transforming education in the region. QRF and Google.org’s collaboration on Edraak’s school-learners platform was announced in May 2017. The platform will build on QRF and Google.org’s efforts in offline functionality and support, ensuring equitable access to the region’s most vulnerable children.